Notes: In 2015. Medicaid expansion states include the 32 states (including DC) that have adopted the Medicaid expansion as of April 2016. Wisconsin covers adults up to 100% FPL in Medicaid but did not adopt the Medicaid Expansion. Tax Credit Eligible includes adults in MN and NY who are eligible for coverage through the Basic Health Plan. Low-income workers are nonelderly adult workers ages 19-64 with household incomes <250% FPL. *Indicates a statistically significant difference from Medicaid expansion states at p<.05 level. Data may not sum to 100% due to rounding. 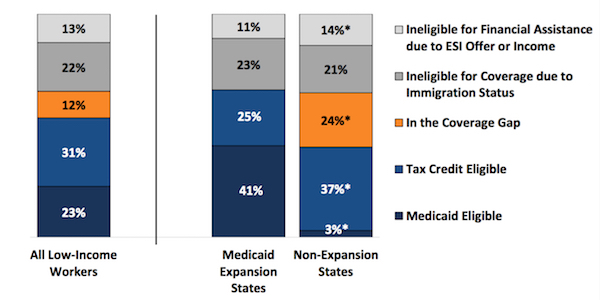 Data Source: Kaiser Family Foundation analysis based on 2015 Medicaid eligibility levels updated to reflect state Medicaid expansion decisions as of April 2016 and 2015 ASEC Supplement to the CPS. This entry was posted in Data Watch on June 22, 2016 by Christopher Barbey.